Double terminator added to our cloned part K519010. SmtA is a metallothionein that can bind to heavy metal ions such as Cd(II). This SmtA is cloned from Synechococcus sp. PCC7942, a cyanobacterial strain. 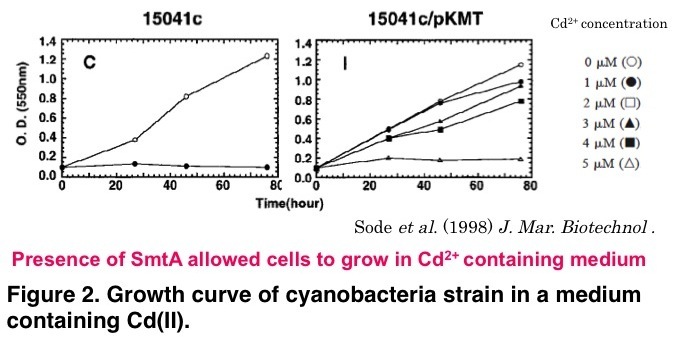 SmtA is a type II metallothionein with a reduced cys content.It was reported that marine cyanobacterium that does not originally harbor a homologous gene, when genetically engineered to express SmtA, could tolerate medium containing Cd(II), Zn(II) and Cu(II) (Sode et al., 1998).